b. Without prejudice to the agreements expressly made between the Parties, the following general terms of sale are based on the following regulations: The EEC sales are regulated in accordance with the current EEC sales regulations. The non-EEC sales are regulated in accordance with the current international sales regulations. a. The Contract is performed when the Seller receives the purchase order from the Buyer according to Seller’s proposal. b. The acceptance of Seller’s proposal – expressed from the Buyer through the purchase order – is irrevocable. a. Any technical or commercial information on weight, size, capacity, price and efficiency, shown on catalogues, brochures, leaflets, advertisements, drawings, pricelists and any other information about the goods, have a mere indicative purpose and will be binding only if they are expressly specified in the Contract. b. The Seller reserves the right to introduce suitable changes to the products without altering the main essential specifications of said products. a. Payments must be made according to the provisions of the Contract. Rounding off or deductions are not allowed. b. In the event of delay in the payment or breach of Contract from the Buyer, the Seller reserves the right to stop the delivery of the purchased goods. c. A payment’s delay implies the application of legal bank interests according to article 5 of D. Lgs. 231/02 (Directive 2000/35/EC) (ECB six-monthly rate, increased of seven points). a. The delivery time confirmed by the Seller is merely indicative and is not a deadline. b. 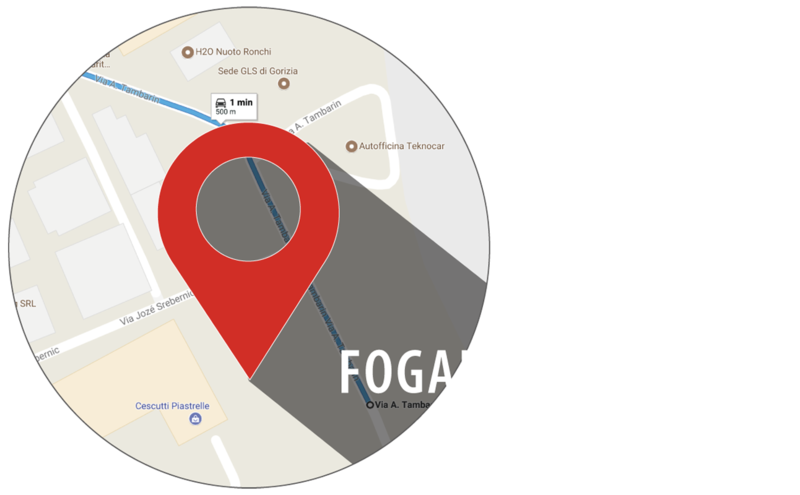 The delivery of the goods is Ex-Works (EXW) Fogal Refrigeration S.r.l. (Via Tambarin n.1, Ronchi dei Legionari / Go), as well as goods’ collection if it is arranged by the Seller. c. Any transport insurance must be requested by the Buyer who will bear all related expenses. d. The Buyer is responsible for any risk concerning the transport. e. The Buyer is obliged to collect the goods which the Seller put at his disposal. If a delay in goods’ collection occurs, the Seller is entitled to store the goods in a warehouse at his expense. The transfer of the goods in the warehouse is equivalent to the delivery to the Seller and the relevant risks are transferred to the Seller. f. Before accepting the goods from the carrier, the Buyer must check them carefully. He has to notify immediately the carrier, and indicate any kind of damage or loss on the delivery documents. g. Any complaint about the state of the packing, quantity, number or outer aspect of the goods (apparent defects) must be reported in writing to the Seller within seven days from receipt of the goods under penalty of forfeiture. A detailed list with all the defects and dissimilarities noted by the Buyer must be sent to the Seller not later than twenty-four months from the date of delivery under penalty of invalidation by prescription. h. Any other complaint about defects that cannot be found out through a careful inspection upon receiving the goods (hidden defects) must be sent in writing to the Seller within seven days from the discovery of such defects under penalty of invalidation by decadence and not later than twenty-four months from the date of delivery under penalty of invalidation by prescription. The defects and the dissimilarities must be indicated in detail. Under those circumstances, the Buyer must keep the packing and ask the carrier in order to check immediately. i. If an immediate report of the claim is not drawn up, the goods are accepted and complying with the purchase order. j. Any claim report does not allow the Buyer to delay or stop the payment of the complaint goods or stop other outstanding payments. k. The inspection performed by or on Buyer’s charge at Seller’s site means acceptance of the goods from the Buyer and disclaimer of any kind of complaint or claim against the Seller. The Seller can delay or stop the execution of his contractual obligation in case of extraordinary events such as strikes, boycotts, lock-outs, fires, wars (whether declared or not), civil wars, riots, revolutions, requisitions, embargos, power cuts, delays in delivery of components or raw materials, or caused by Buyer’s deeds or failures (i.e. mistakes or lack of essential information in the purchase order). In case of unavailability of components or raw material, the Seller will replace these components/ raw materials by others of the same quality, origin and life. This condition might cause the non- fulfillment of a willful requisite as the third part marking. a. Any kind of drawing, documentation, technical data or software on products’ specifications or relating to the manufacturing and assembling of the goods received by the Buyer remains under the Seller’s exclusive property. b. Without the written permission of the Seller, the Buyer is not allowed to sell, exchange, reproduce, use for purposes not specified in the Contract, transmit or communicate to other people not involved in the Contract data, drawings, software and generally any kind of technical information about the purchased goods coming from the Seller. a. The property of the goods is transferred to the Buyer when such goods are delivered to the carrier. b. In the event of deferred or incomplete payment upon delivery, the goods’ property remains with the Seller until the payment is settled. c. Under those circumstances the Buyer undertakes to establish a valuable retention of title for the Seller in the country where the goods are stored; the Seller is authorized to take any necessary action, at Buyer’s expense, in order to enforce the retention of title against third parties, including the registration of the retention of title at the local authority in the country of the Buyer. d. The Buyer must co-operate with the Seller to set up and implement the necessary measures to protect Seller’s property right. Under those circumstances, the Buyer is not allowed to resell, give over or exact warranty before the payment has been settled. e. In case of non-compliance with the above-mentioned provisions, the Buyer must reimburse damages to the Seller. a. The Seller guarantees that the supplied goods comply with the Contract. The warranty for defects is restricted to designing, raw materials or assembling defects of the Goods caused by the Seller and it is not valid if there is no proof, from the Buyer, of a proper use, maintenance and storage of goods. b. The warranty has a twenty-four months’ validity – electrical parts excepted – which starts on the EXW Ronchi dei Legionari delivery date of the goods and it is subordinate to Buyer’s written claim according to article no. 5.
d) declare in writing the cancellation of the Contract, by refunding the Buyer for the price indicated in the purchase order with the return of the goods to the Seller. d. In the event of a refund, the Seller must not exceed the price indicated in the purchase order. e. The above-mentioned warranty includes and substitutes any other responsibility of the Seller and all legal warranties, expenses and damages for defects related to the goods. Once the warranty has expired, the Buyer has no longer title to claim against the Seller. a. The Seller is responsible for the damages incurred to people or things caused by the supplied goods only in the event of proved serious negligence in the production of the above-mentioned goods; in no other event the Seller is responsible for indirect or consequential damages, loss of production or lack of profit. b. Without prejudice to the above, the Buyer guarantees the Seller for actions taken by third parties who suffered damages with reference to the delivered goods. The Buyer must refund the Seller for damages suffered because of the claim. By purchasing the goods, the extra European importer guarantees the final destination and the civil use of the goods and guarantees the non-involvement in any military activity. For any action that could take place in relation with this Contract, the place of jurisdiction will be the Seller’s. Nevertheless, the Seller is entitled to suit a legal action against the Buyer in his country, where the place of jurisdiction is located. The Italian version of these terms of sale has to be considered prevailing on any other language versions.